Leicester Tigers are "very close" to signing Italy flanker Robert Barbieri, says chief executive Simon Cohen. He told BBC Radio Leicester's Leicester Tigers Rugby Show fellow Treviso men Michele Rizzo, Leonardo Ghiraldini and Christian Loamanu are also shortlisted. Castres' Seremaia Bai and Rotherham's Laurence Pearce are further targets. "I'd like to think that when we're done people will look at it and think it's a slightly stronger squad than last year, if the same size," said Cohen. "I think it's well documented that we're talking to a couple of Treviso players - we clearly have to find a replacement for Thomas Waldrom, who's indicated he's going, and we know Toby [Flood] is going. "Barbieri plays eight for Treviso and seven for Italy and would give us some flexibility and a little bit more coverage. That would be a good deal to get across the line and that deal is very close." 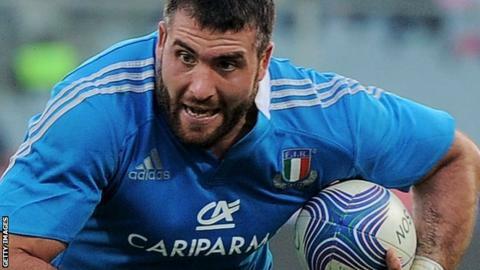 However, Cohen has ruled out signing another Treviso player and Italy international, Lorenzo Cittadini. But, after seeing the Tigers lose 22-16 to Clermont Auvergne in the Heineken Cup quarter-final last weekend, he confirmed negotiations are ongoing for Gloucester and England fly-half Freddie Burns. Deals are on the table for current Tigers players Niki Goneva, Rob Hawkins and Dan Bowden, with all three understood to also be considering other offers. Cohen indicated head coach Richard Cockerill is still weighing up the future of Pablo Matera. He said: "We are trying everything we can do to keep Niki - we made him a really good offer and have given him time to think about it. "But obviously it can't go on forever. He hasn't accepted that offer and we won't change our offer, so he has to change his mind for that to happen. "Rob and Dan have done a really good job for the club and it would be a shame if they went, but I understand are looking at other options."